Based on this the order goes 'Babylon', 'Legacies', 'Signs'. Since other factors place 'Babylon' quite late in the season, this means 'Signs' ends up even later. It does seem strange when one's used to 'Signs' position as an almost out-of-nowhere glimpse of the broader story, which then recedes before resurfacing at the season finale - however I think it can also work as a near-season end "mini-climax" (similar to 'The Long, Twilight Struggle' or 'Shadow Dancing') by tying up the season's Raiders storyline with a big space battle! But for me the most compelling argument to place 'Signs' after 'Babylon' is to strengthen Delenn's late-Season One character arc. This is one of my favourite parts of Season One because it's all but invisible on first viewing, with the sub-text only evident on re-watching. 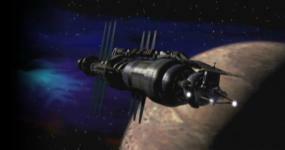 - as she continues to build the device, Delenn is visited by Morden. Sensing the presence of his companions, she realises: "they're here"
- fueled by her recent encounter, she sends Lennier to Kosh with the question "Have the Shadows returned to Z'ha'dum?". Kosh responds "Yes." WOW! Thanks so much for chiming in okesh_naranell. Well I think this is HUGELY important. I want to introduce a newbie to the show and the more consistent every little detail can be tied together the better. He was a toddler at the time the show was on, so his experience of television is vastly different than my own. The reason I want to show him the show in this order is not only trying to create as much consistency as possible, but also so I can come to this list and show him the dates. Having said all of this I have a doubt. As we all know it is nearly impossible to pick up on EVERY little detail the first time around. This makes me think that maybe I should show him the show in an order closer to the original air date order the first time around. I know he is likely going to like the show and if he watches it a second time in this order it might be like seeing it for the first time all over again. I don't know. That is probably how I would have done it the second time around if I had this list when I did it. I think my only objection is that "Signs" is such a teaser episode, hinting at so much to come, that I like it arriving a little earlier to get people's attention! I can see that. It definitely makes viewers pay attention to the fact that the episode might be important down the road. Bearing in mind I did all the ground work over 20 years ago, I'll do my best. Much of the dating from Season One was worked out on the dialogue and visual clues in the episodes. For example "And the Sky, Full of Stars" we get the information from Knight 2 about Sinclair being 39 born in May 2218. So this was placed before his birthday. Also Garibaldi was reading Universe Today that had an article about Shaal Mayan accorded honours so that puts it after "The War Prayer". "Soul Hunter" was dated from Franklin's framed order you see in "Interludes and Examinations" so that gave me a date for the "Soul Hunter" story. "Infection" I placed after that. There's a scene scripted in "And the Sky, Full of Stars" where Knight 2 makes Sinclair relive his confrontation with the Ikarran war machine, saying it was last month so that places that story in March and "And the Sky.." in April. The placement of "Born to the Purple" comes from Garibaldi's comments in "Infection" about Security being arranged for next Tuesday for the Narn/Centauri negotiations (The Euphrates treaty) which Londo as we learned in Born to the Purple he had been ducking for a week, presumably because of Adira. "A Voice in the Wilderness" was the last story where you see Delenn's quarters without the Chrysalis device, the table she builds it on is empty. "Babylon Squared" Joe confirmed that she got the Triluminary and the Chrysalis Device on her visit to the Grey Council Cruiser and brought it back to B5. She started building it so Legacies, Grail and Signs and Portents (which had an on air date) are ordered on the basis of what stage she was at building it. All very logical! Thank you. Pretty much as I saw it Joe authorised it and he posted on the matter, which I copied at the top of the thread. With the impending arrival of B5 on Amazon Prime I have started watching the show in the "Approved Chronological Viewing Order". I just finished MIND WAR, 1.6, in this chronological order and I have to say I am really enjoying it so far. Maybe it is just because it is a new way to view it, but I like how some things have come together. I like having Bester introduced after AND THE SKY FULL OF STARS, 1.8. It really drives it home when Sinclair says he doesn't want people messing with his head. Plus I think it also makes you question if Knight One and Knight Two were connected to Psi Corps or Home Guard. Plus pushing MIND WAR, 1.6, two episodes further in gives us more time thinking G'Kar is a bad guy. His assistance to Catherine Sakai, even after she rejected it, is a real first step for the audience to see he isn't only about serving his own agenda. Plus I feel like introducing Bester a little later gives a new twist. Having Bester introduced after the events of 1.4 INFECTION, 1.7 WAR PRAYER, and 1.8 AND THE SKY FULL OF STARS makes more sense to me. These episodes all present possible threats that could come from Earth and Bester, along with Psi Corps, end up being the greatest of those threats. So I am really looking forward to more things fitting together in ways I haven't seen before. Okay just got to A Voice in The Wilderness and everything is going great. This order is really putting a new dynamic on everything. I love it.